Protect your indoor air quality with expert acoustic ceiling removal in Granada Hills CA. When you have cottage cheese or popcorn ceilings, there is more than just an ugly ceiling to worry about. These materials may very well be made from dangerous asbestos fibers. 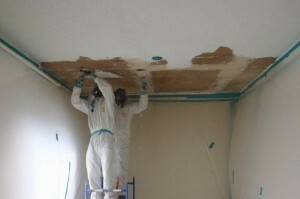 The good news is that with careful acoustic ceiling removal in Granada Hills CA from AQHI Inc., you can keep your indoor air free of asbestos contamination. Acoustic ceiling removal in Granada Hills CA helps prevent contamination by removing the materials that could release asbestos fibers. However, it is important that the removal be done correctly, by a qualified contractor, in order to reap any safety benefits. Asbestos dust will be generated when removing an acoustic ceiling–the key is to contain and control this dust. If you try a DIY job or use an inexperienced contractor, this will not be done properly. Contamination may spread from the room with the asbestos ceiling to other parts of your property. AQHI Inc. is a licensed, certified, and insured asbestos removal contractor with over 20 years of experience and more than 50,000 successful remediation projects to our credit. We are fully committed to delivering the best quality service on every project, whether you need acoustic ceiling removal in Granada Hills CA for one room or for an entire commercial property. For a quote on acoustic ceiling removal in Granada Hills CA or to learn more about our services and our qualifications, please contact us at 800-481-8080. Our asbestos removal office for Acoustic Ceiling Removal in Granada Hills CA is open Monday through Friday between 8:00 AM and 5:00 PM and closed for lunch from noon to 1:00 PM. With advance notice, projects can be scheduled for weekends, early mornings and evenings.